Cellcom consent to operate a signal booster on Cellcom’s network is limited to the personal use of signal boosters certified by the FCC under 47 C.F.R. section 20.21(a). Registration of a signal booster with Cellcom does not mean that Cellcom has consented to the operation of non-certified signal boosters on its network. Under FCC rules, any signal booster, whether certified by the FCC or not, that causes harmful interference to Cellcom's network or to its customers must cease operation immediately upon notice from Cellcom or the FCC. What is a Cellular Signal Booster? Signal boosters are devices that can help cell phone users improve their coverage in areas where they do not get a great cellular reception. For example, signal boosters can be placed in homes or offices to provide increased signal strength for cell phones, which may let the user complete a call in areas where they previously couldn’t. When these devices are properly installed, they can help consumers, wireless service providers, and public safety first responders by extending cell phone coverage to areas that would otherwise have weak signals such as tunnels, subways, inside buildings, and in rural areas. Although signal boosters can improve cell phone coverage, malfunctioning, poorly designed, or improperly installed signal boosters can interfere with wireless networks and cause interference to a range of calls, including emergency and 911 calls. On February 20, 2013, the Federal Communications Commission (FCC) adopted new rules governing the design and operation of consumer signal boosters, which are boosters designed to improve coverage in vehicles, homes and small offices. By registering your booster, you agree that the cellular booster meets all FCC requirements. 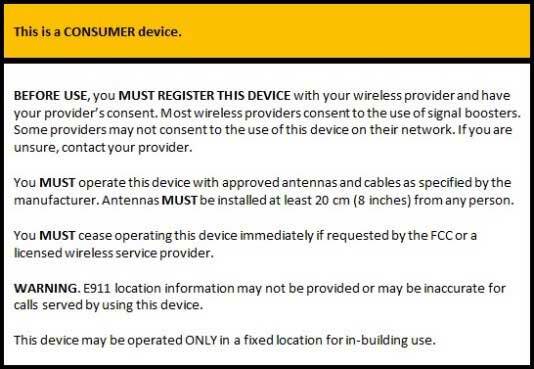 Note: After March 1, 2014, all consumer boosters sold in the United States will be required to meet new network protection standards intended to reduce the likelihood that consumer boosters will interfere with wireless networks and devices. *If you are relocating a booster that you previously registered with Cellcom, please contact Customer Loyalty at 877-611-0010. Your session is about to expire. Would you like to extend it?